The Republic of Finland (Suomen tasavalta) is a country in northwestern Europe on the Baltic Sea. Finland is one of Europe’s most northerly countries, with about one-third of its area lying north of the Arctic Circle. The earliest traces of human habitation in Finland date from about 8000 BC, when the most recent of the Ice Ages was retreating. These ancient hunters and gatherers probably arrived from the east. Pottery making characterized another type of Stone Age culture, starting around 3000 BC, known as the Comb-Ceramic; its practitioners were of a different origin. The succeeding Battle-Ax culture (1800-1600 BC) may have been brought to Finland by an Indo-European people from a more southerly Baltic region. These people were able navigators and also introduced agriculture. A merger of the Battle-Ax people and the previous dwellers resulted in the so-called Kiukainen culture (1600-1200 BC). During the age of the Vikings the Finns became exposed to both eastern and western influences. Vikings from Sweden colonized the Åland Islands in the 6th century as a base for their journeys of pillage and trade into Russia as far south as the Black Sea. Although they did not actually participate in these Viking expeditions, the Finns benefited by the growing contact and the establishment of trading colonies in their country by merchants from Sweden and the island of Gotland. At the end of the 11th century 3 Finnish tribes had spread as far north as the 62nd parallel: the Finns proper in the southwest, the Tavastians in the interior lake district, and the Karelians to the east. The Saami were also living in the wilderness to the north. No unified government or state existed. Finland has a highly industrialized, largely free-market economy, with per capita output roughly that of the UK, France, Germany, and Italy. Its key economic sector is manufacturing - principally the wood, metals, engineering, telecommunications, and electronics industries. Trade is important, with exports equaling one-third of GDP. Except for timber and several minerals, Finland depends on imports of raw materials, energy, and some components for manufactured goods. Because of the climate, agricultural development is limited to maintaining self-sufficiency in basic products. Forestry, an important export earner, provides a secondary occupation for the rural population. Rapidly increasing integration with Western Europe - Finland was one of the 12 countries joining the European Economic and Monetary Union (EMU) - will dominate the economic picture over the next several years. Population: 5,5 million (July 2018 est. ), concentrated on small southwestern coastal plain. Religions: Lutheran 70.9%, Greek Orthodox 1.1%, other 1.7%, unspecified 26.3% (2017 est.). Ethnic groups: Finn, Swede, Russian, Estonian, Romani, Sami. Language: Finnish (official) 87.9%, Swedish (official) 5.2%, Russian 1.4%, other 5.5% (2017 est.). Nationality: noun: Finn(s), adjective: Finnish. 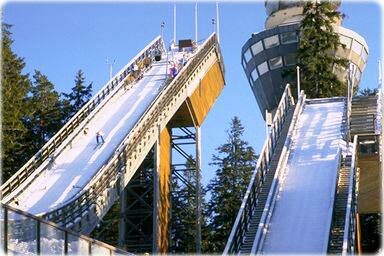 Ski jumps with observation tower, in Kuopio, Finland. Country name: Republic of Finland (local: Suomen Tasavalta). 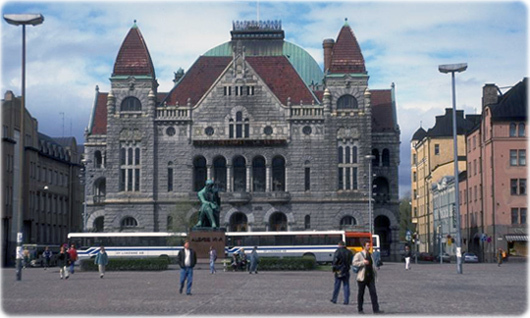 Capital: Helsinki. It is northernmost national capital on European continent. 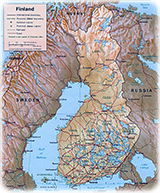 Administrative divisions: 6 provinces (laanit, singular - laani); Aland, Etela-Suomen Laani, Ita-Suomen Laani, Lansi-Suomen Laani, Lappi, Oulun Laani. Terrain: mostly low, flat to rolling plains interspersed with lakes and low hills . Coastline: 1,126 km (excludes islands and coastal indentations). Highest point: Halti 1,328 m.
Climate: cold temperate; potentially subarctic but comparatively mild because of moderating influence of the North Atlantic Current, Baltic Sea, and more than 60,000 lakes. Ports and harbors: Hamina, Helsinki, Kokkola, Kotka, Loviisa, Oulu, Pori, Rauma, Turku, Uusikaupunki, Varkaus. 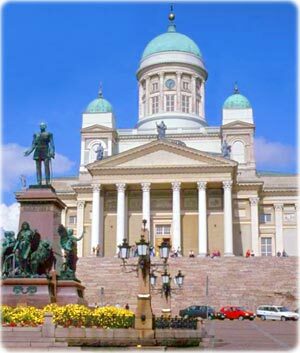 Lutheran Cathedral, Senate Square, Helsinki. Copyright © Geographic Guide - More in Europe: Austria, Belgium, Bulgaria, Malta, Russia. Main source: CIA - The World Factbook.